Cousins on either side of the puberty divide find common ground in Nana’s surprise birthday party. The narrator of this tale is a youngish boy who has to contend with his blossoming cousin Hortense during a stay one summer at the family lakeside cabin. The visit might once have been cause for joy—monkeying around on the tire swing, swimming and building sand castles, picking berries, sharing a room—but that is either inappropriate or off the table, since Hortense is now a young lady (with airs to boot, though that theme is not developed, unless using a blow-dryer sums it up). Hortense doesn’t want to have much to do with the no-name narrator, until out of the blue she says, “I know I haven’t been playing with you as much as you’d hoped. And I’m sorry. 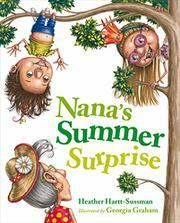 But I have an idea.” The idea is to throw Nana a birthday party, which the narrator turns into a surprise party, to everyone’s delight. The story is too glancing to develop much sympathy for any of the characters—“I’m not impressed,” is the narrator’s refrain, along with “gross!”—and the narrator is too young to delve meaningfully into Hortense’s changes. The artwork, on the other hand, is a lovely display of chalk pastel; even if the characters look like Claymation gnomes, the colors look like they are lit from within, giving a fairy-tale quality to the work.